AD-A27 Bluetooth MP3 player with car charger is designed for car. 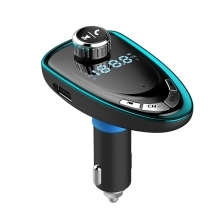 It can decode music files which you download to TF card and USB disk, then transmit to your car stereo through FM transmitter; and can also enjoy wireless music via Bluetooth connection. With this product, you can also answer and end Hands-free calls with built-in microphone, bringing you much fun and convenience. Modulate the FM frequency the same as that in the car radio (blank frequency), connecte your phone and A27 via Bluetooth, then you can enjoy music or navigation in your phone. It supports 12V-24V input voltage, charging with max voltage output 5V 2.1A for mobile devices. You can charge your phones or Pads in car. Pair with phones, support Bluetooth Hands-free calling, can easily answer, hang up, reject and redial calls to ensure driving safety. You can download your favorite music to your U Disk or TF card, insert them in the device and play music in car stereo via FM radio signal. Support Line audio input, connecting phones, MP3, MP4 with this car charger by 3.5mm audio cable and then transmitting to car stereo.